The 7I96 is a Ethernet connected motion control interface designed for interfacing up to 5 Axis of step&dir step motor or servo motor drives. Step rates up to 10 MHz are supported. The 7I96 also has 11 isolated inputs plus 6 isolated outputs for general purpose I/O use. A high speed encoder interface is provided for spindle synchronized motion. A RS-422/RS485 serial expansion port and a parallel expansion port. All step and direction outputs are buffered 5V signals that can drive 24 mA. All outputs support differential mode to reduce susceptibility to noise. The spindle encoder can be used with TTL or differential input. 11 isolated inputs provided for general control use including limit switch and control panel inputs. Inputs operate with 3V to 36V DC and can have a positive or negative common for sourcing or sinking input applications. Six 36V 2A isolated outputs allow sinking, sourcing combinations of both. 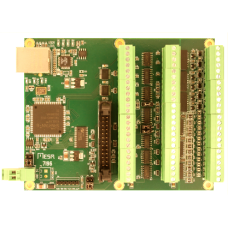 One RS-422/RS-485 interface is provided for I/O expansion via a serial I/O daughtercard. In addition to the on card I/O, A FPGA expansion connector compatible with Mesa's 25 pin daughtercards or standard parallel port breakout boards allow almost unlimited I/O options including additional quadrature or absolute encoder inputs, step/dir or PWM/dir outputs, and field I/O expansion to hundreds of I/O of points. All field wiring is terminated in pluggable 3.5 mm screw terminal blocks.